I mentioned recently that I don't really feel like it's summer until the stone fruit appear in the market. That's true of all stone fruit: peaches, plums, nectarines, cherries, and so on. 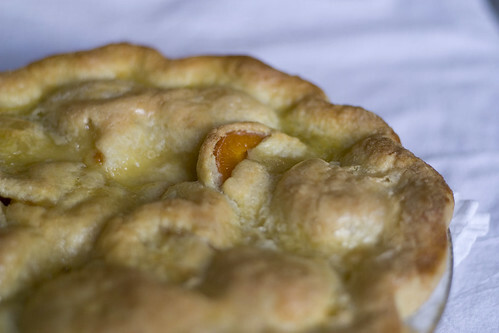 But the food that I most associate with summer, the food without which it cannot possibly be summer, is apricot pie. 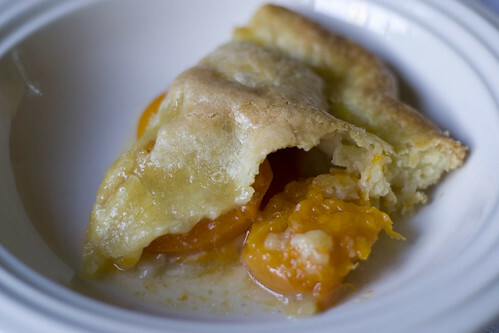 And not just any apricot pie, Blenheim apricot pie. Because I am an unapologetic apricot snob and will not eat or cook with apricots unless they're Blenheims, this is the only time of year I make apricot pie. Blenheims come in for two or three weeks every year, and around here those weeks start just after the summer solstice. Typically peak Blenheim time is the tail end of June and first few days of July, which works out nicely for Fourth of July desserts involving apricots. 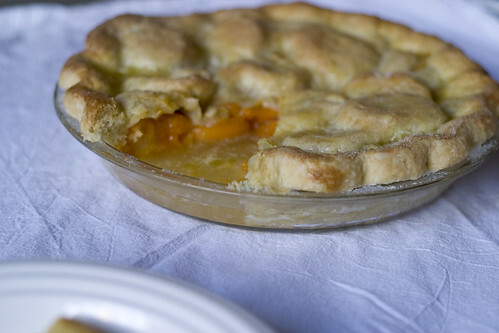 As such, apricot pie is a kind of opening games dessert, declaring summer well and truly here. It signifies for me not just summer, but the warm, leisurely evenings early in summer when we kids were still basking in the glow of the first few days of summer vacation. This is a fat and happy dessert, a lazy days dessert, a dessert that is guaranteed to put a smile on my face with just one whiff. The preparation, as with most pies, is simple: line a pie plate with one crust, add some fruit and seasonings, cover with another crust, and bake until browned and bubbling. In this case, the seasoning includes a bit of sugar (adjust to taste), some flour or cornstarch to thicken up all of the juices that the apricots produce, a bit of lemon juice for brightness, and some nutmeg to deepen the flavor a bit. It's a good basic pie. Nothing too fancy, nothing but good summer flavor. Recipe after the jump. Place an oven rack in the middle position, place a baking sheet on a lower rack (to catch any overflowing juices), and preheat the oven to 425F/220C. Roll out half of the pastry dough (keep the rest chilled) and line a 9-inch pie plate. Use kitchen shears or a sharp knife to trim the excess so that you have about 1 inch of overhang. Chill the crust while you prepare the remaining ingredients. Mix together the sugar, flour or cornstarch, and nutmeg in a small bowl and set aside. 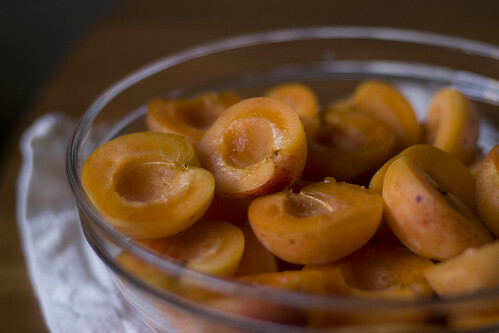 Halve the apricots lengthwise, and remove the pits. 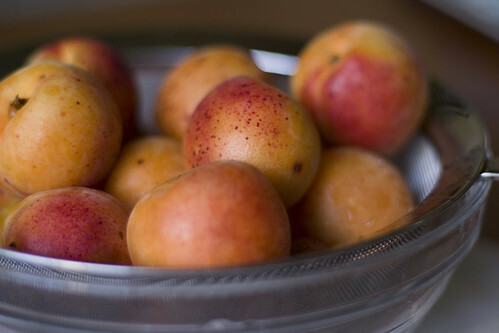 Retrieve the pie plate from the fridge, and arrange half of the apricots in the lined plate. Sprinkle half of the sugar mixture over them. Spread all remaining apricots on top, and sprinkle with the rest of the sugar mixture. Squeeze the lemon over the pie, then dot the apricots with the butter. Roll out the other half of the pastry dough, and drape it over the pie. Cut the overhang to about 1 inch, then fold the overhang of both the top and the bottom crust together and tuck it underneath the bottom crust to create a neat edge. 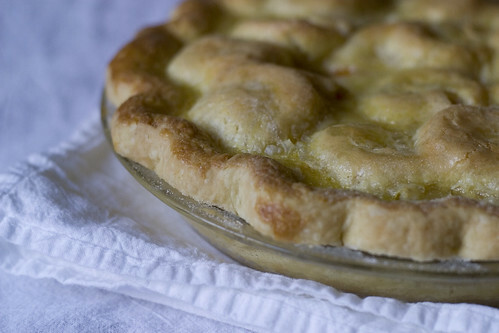 Flute or crimp the edges as desired, then cut a few steam vents in the top of the pie. Bake for 15 minutes, then lower the heat to 350F/175C and bake or a further 30-40 minutes, or until the crust is nicely browned and the juices are bubbling. Cool completely or to warm room temperature before serving. My favorite pie crust can be found here. I seem to recall something about placing the apricots cut side up, but I can't remember where I heard it, so take it with a grain of salt. For extra presentation points, before cutting the steam vents, brush the top of the crust with a beaten egg and sprinkle it with a few tablespoons of sugar. The pie keeps at room temperature for about a day. Yesterday I had the urge to make an apple pie . . . a sure sign of tne waning summer. Our weather has gone all autumnal. You know, I've wondered if you can get Blenheim apricots there, but I don't know. I looked around, and apparently they're also called Royal Blenheims, or even just Royals. I'm not sure what they would be called over there, so keep an eye out for both names. If you can find them, it will be either at a farmer's market or directly from an orchard, as they don't ship or handle well enough to be stocked in supermarkets. Or! (And this is where I could perhaps be considered a bad influence...) You could get a tree! Assuming that you'll be around for a few years to give it time to bear fruit. In the short term, though, ask around at your local farmer's market. I'm still too much in the thrall of summer berries to be ready for autumn fruit. We haven't even gotten into real tomato season, and the peppers are just starting, so summer still has plenty of life in it here. That said, an apple pie does sound good! I did look at apricots at the grocery store yesterday but they didn't look very good and they weren't Blenheims. I intend on investigating this matter! It was only 60 degrees today. My little daughter and her friend went blackberrying in the rain.